Sweetgrass Hydrosol – Nascent Naturals Inc.
Sweetgrass – Hierochloe odorata The origin of the name sweetgrass emanates from the Greek word “Hieros” which means sacred or holy, and “Chloe” which simply refers to grass. Sorry, larger sizes temporarily out of stock! The origin of the name sweetgrass emanates from the Greek word “Hieros” which means sacred or holy, and “Chloe” which simply refers to grass. This grass grows abundantly in many parts of the world particularly North America but several other species are found in Greenland, Iceland, Northern Asia and Europe. It prefers marsh like wetlands to flourish. In North America, it is best known for ceremonial purposes in Native culture to clear and purify the air in churches and other sacred or holy places. The aroma is quite peculiar and similar to the freshness of cut grass or hay. In my opinion, it is the best natural plant which captures the scent of fresh rain. Unlike most herbs, sweetgrass aroma strengthens when the plant is dried. The plant does not produce an essential oil, but the hydrosol is quite fragrant. 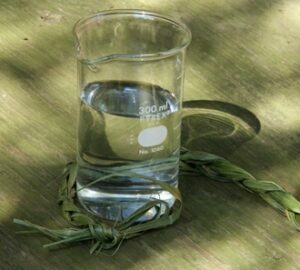 Spiritual Purification – The properties of sweetgrass as a smudge are well known, but if producing smoke is not an option, then try using this hydrosol as a spray. Simply put some into a spray bottle and use liberally. You can use it full strength or dilute with water or add other hydrosols. 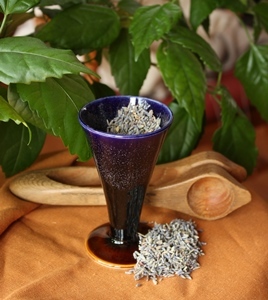 Try adding some sage (first diluted in glycerine) for added aroma and potency. Skincare – Great addition to creams and lotions. Provides a fresh aroma and astringent properties. Use with other hydrosols and / or glycerine as a toner to freshen or cleanse skin.